Fortunately for man, he is never left without help when it is needed. However difficult the circumstances, however great and grave the dangers which he faces, of one thing he can be sure: he will never be abandoned by his Elder Brothers. Time after time in men’s long history, when all seemed lost and the future of man perilously unsure, Our succour has been forthcoming and the forward path of men restored once more. So it is today at this tumultuous time when men stand in a maelstrom of warring forces, unsure of the next step and all but overwhelmed by the enormity of the task ahead. Emerging from Our ancient retreats, We redirect Our thoughts and steps to aid Our struggling brothers. To show, by example, that all is not lost, that another, and better, way exists for men to organize their lives; that unity and happiness come from justice and freedom; that sharing is the natural action of unity and the simple answer to all man’s woes. Men must desire the gift of Wisdom We have to give. The Great Law does not allow its imposition. Thus do men require to look clearly at the dangers which beset them, and so make their decision and choice. That men need guidance is beyond dispute (though many would deny that this is so or possible to find) and this guidance will Maitreya, Himself, offer to men for their consideration and wise counsel. Responding, men must see themselves as One. The old barriers to freedom and justice must be discarded; all must share in the Earth’s bounty; all must learn the language of trust. Planet Earth, our home, must be nursed back to health, its air, soil and waters purified, made safe again for man. These are the urgent requirements for the stabilization of the Planet and the health of its inhabitants. Once adopted, there will be no return to the disorder of the past. Man will part company with poverty and war, exploitation and cruelty, corruption and injustice. Men will emulate their Elder Brothers and walk the path of Love and Peace. See this time as the time of Decision. All rests on man’s response to Maitreya’s counsel. We, your Elder Brothers, are neither anxious nor complacent. We know the enormous task that faces both Maitreya and men. We also know how to read the Signs of Life and are not afraid. Be you who read this not afraid but spread abroad the fact that the Restoration of Earth is at hand, that the iniquities of the past are fading and with them the old ways of governance. A new Guidance is here to show the way for men, an ancient but ever new Guidance to take men to the Mountain Top. Q. You say that nuclear fission energy is dangerous and that fusion is not. In Japan there is a facility for fusion experiment and it is said that fusion is dangerous. A. There may well be experiments on nuclear fusion, there are in many places in the world, but so far no one has come up with a device which in commercial terms is worthwhile developing. There is a process, still to be discovered, which is inexpensive and safe, using a simple isotope of water. Also, and this is criminal, there are instances where a certain fusion process has been developed and bought by the nuclear fission authorities and is sitting on a shelf, or in a safe in that institution, awaiting development – which will never happen because it would interfere with the millions of dollars which are being generated for some people by nuclear fission. There are also many plans for cars which do not need petrol which are sitting in the safes of the great automobile manufacturers until oil runs out. Our planet Earth is limping, ailing, through space. From our misuse of resources, from the insane competition between the nations, we have rendered our planet sick. The restoration of the health of our planet must become our number one priority after the saving of the starving millions. The worst pollution poisoning everything – the waters, the air, the rivers, seas – is nuclear radiation which we cannot even see or measure. We build nuclear reactors around the world but our scientists cannot see the effects of their ignorant actions. The instruments which they have to check and measure the radiation are crude and cannot register the higher radiation. They recognize only the dense-physical plane but there are seven levels of matter. Above the dense-physical plane there are four planes which are etheric, but which are still matter. Our scientists cannot measure beyond some levels of the dense-physical plane, so crude are their instruments, while the worst effects of radiation are on the four highest planes. The growing incidence of Alzheimer’s disease at a younger and younger age is a direct result of this pollution. We have much to learn. A new humility is very much in order. Q. Was the large-scale and very public anti-terrorist operation in London on 3 June 2006 in response to a genuine threat or was it largely for propaganda purposes? A. It was not done for propaganda purposes but neither was it a genuine threat. The police of course have to react to every bit of so-called ‘intelligence’ they receive, from whatever source, but in this case they do seem to have overreacted badly! Q. The film The Da Vinci Code has just been released. In Leonardo da Vinci’s famous painting of the Last Supper there are said to be hidden codes. (1) Is this true? (2) Is the person next to Jesus Mary Magdalene? (3) Did Jesus and Mary Magdalene have a child? A. (1) No. (2) No. John. (3) No. The Da Vinci Code book and film are pure fiction. Q. Can children experience the Blessing on the Day of Declaration? A. On the Day of Declaration all people above the age of 14 will hear Maitreya’s words in their minds in their own language. It is not a question that younger children cannot experience His Blessing – on the contrary, but it is more a question of whether their minds can take in and relate to His message. Q. In 2004, Shankaracharya of Kanchi (South India) was arrested and charged with murder. To protest against his arrest, Muslims and Hindus were united in marching. Some Hindu monks say there is fear of ‘trial by media’. (1) Behind the case of Shankaracharya’s arrest, are there any politicians’ conspiracies to get their own benefits using police force, as with the case of Swami Premananda? (2) And furthermore, behind this sequence of plots against spiritual persons is there the force of the so-called Black Lodge? (3) Are the targets mainly Hindu spiritual leaders, because Maitreya is now teaching in Hindu temples in London? A. (1) Yes. (2) No. (3) No. The attacks on spiritual leaders in India come from secular, right-wing groups who believe they are creating a ‘modern’ India no longer being influenced by ‘superstition and religious corruption’, which, they believe, has held India back in the past. Q. A criticism I have heard of Sai Baba is that he does cheap magic tricks. I have met a lot of his followers who have these really cheap looking rings. He says he takes gifts from the elemental fields. A. The higher you are the more people want to bring you down. You can’t get higher than Sai Baba. Those who are against Him want to bring Him down. He has no need to buy cheap rings, He can make them without effort. For Him it is not a miracle. The person getting it is breathless, because they have a cheap little ring made by Sai Baba. Audience member: My criticism is He is taking gifts from the elemental field. But you don’t know if He is not putting it back! Q. Why do we have to wait to see Maitreya? Not everyone can wait for this to happen! A. You will have to wait because there is a moment which is the best possible moment for Maitreya to appear and that moment He will choose. You have to trust Him. That is the thing. People don’t have the trust. You have no one else to trust. Trust yourself? All right, change the world, make everyone happy tomorrow! You can’t do it. You have to trust the World Teacher to help us, because He is so wise, the Lord of Love, embodying the Love of God. If you can’t trust Him to know the best time, who else can you trust? Trust and relax and don’t be so impatient. Questionner: That is my nature! I know it is your nature! But your nature is your conditioning. Q. Set against the past destructive tendencies of the UK government, recent pronouncements seem to be in line with Maitreya’s priorities, in terms of debt relief, the Commission on Africa, etc. Could your Master give an assessment of the state of consciousness of the nation? A. The British nation, according to my Master, is one of the more advanced. Audience member: We all know it! It may be known in a way which is not true, and not known in a way which is true. That is the point. The differences are minuscule, however, but there are three old nations, which, because of their age, are somewhat more developed than others. They are Britain, France and Japan. Germany is a very young nation. It is a very old people, but as a unified nation it is young. The fact that it looks as if the Western powers are at least focusing their attention on Africa, relieving some of the debt and some of the worst conditions of the day-to-day life of a lot of Africans, while nothing like enough, is a sign that they are beginning to respond to the energies of Maitreya. These energies have been pouring into the world for at least 25 years but it takes time to absorb and then act on them. At last, humanity has absorbed enough, the old patterns have disintegrated enough, to allow a new outlook and initiative which is being brought forward, mainly by Gordon Brown, the Chancellor of the Exchequer in the UK. Q. Could you please help us to know how to approach Lord Maitreya to influence us to do the right thing in our own sphere? A. We have a photograph of the ‘hand’ of Maitreya. Get a copy of that ‘hand’ and invoke His help. Look at the hand and ask Him through the hand. Ask Maitreya whatever it is you need help for. That is all you need to do if you want help. Audience member: I had a pain and I put my hand on the ‘hand’ and within five minutes it was over. You are a man of faith. Audience member: I am a man of faith. I was working at a table of Maitreya’s ‘Hand’ cards at Benjamin Creme’s Nagoya lecture on 23 May 2006. A petite woman of about 70 years came and gazed at the lecture poster placed on the wall behind me and read it out loud: “Greed, competition.” She smiled a bit and said, while looking at me steadily: “Competition, indeed.” “Sharing,” she read out again and looked at me, smiled, and said: “Arrogance!” and again looked at me steadily and smiled. I was pondering on the meaning behind what she was doing. Then she said that people are not honest: “Everyone is wearing masks, aren’t they?” So I said: “We are learning Maitreya’s teachings of honesty of mind, sincerity of spirit and detachment, but it’s difficult.” She said: “Self is the problem, isn’t it?” “That’s right,” I replied. “Live in the now, then there is no space for dishonesty to enter,” she replied. I was struck by her words. We had been attempting to study and practise seriously each of Maitreya’s teachings with our group members, but we got stuck at the statement that “self” is the root of all suffering. She pulled out a wallet from her pocket. A few coins (two 100-yen coins and one 10-yen coin) fell out but she didn’t bother to pick them up. When I picked them up and gave them to her, she said, placing them in our donation box: “There is a hole in my wallet and the money says ‘Let me out, let me out!’” She picked up a ‘Hand’ card and left. Please tell me if this woman was a special person? I was looking after an information table at Benjamin Creme’s lecture in Osaka on 20 May 2006. During the intermission, I saw two women talking about the lecture at a nearby table. I showed them Benjamin Creme’s article on ‘The Law of Cause and Effect’ in the April issue of Share International magazine and explained that it was one of the main pillars of his talk, and so on. The older woman said that it used to be a better world, but now it has become very difficult; she wondered what would happen in the future. The younger woman said: “Everything really is a cause and effect, isn’t it?” She seemed to understand what I was saying already. We talked some more, but the younger woman interrupted my explanation and said: “Rather than your complex explanation, I would like to know how you became involved in this work. That will communicate the true intention behind your explanation and help me understand better. So please tell me your own story.” So I told her that when I first heard Benjamin Creme’s lecture and heard him say ‘be yourself’, I was able to accept what he was saying; Mr Creme’s inclusive personality impressed me and I felt what he was saying was true, and so on. The younger woman’s eyes left an impression on me and I felt as if I had met her somewhere before. I felt close to her. Were these women perhaps Masters? In my garden last year, I grew a climbing plant called Ipomœa or ‘Morning Glory’. 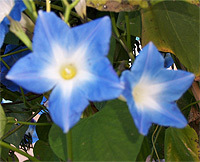 This plant produces funnel-shaped blue flowers with a white and yellow core, opening in the morning and withering in the afternoon of the same day. While these splendid flowers usually show a round-shaped corolla with no separate petals, around the beginning of autumn, I was surprised to discover that some flowers were shaped like five-pointed stars. This star shape made me think of Maitreya. Could this be a sign? It was Sunday 22 November 1998. Late in the evening I was driving from Ljubljana to Novo Mesto where I live. It had been snowing all day, the roads were slushy and slippery. As I was carefully driving an uphill curve I saw a car from the opposite direction sliding downhill towards me. Instinctively, I stepped on the brakes to prevent collision but my car began to slide and turn around on the road. However, we didn’t crash. My car landed in the nearby bushes and snow only a few metres from a precipice. I got out somehow. First I tried to push it back on the road but I wasn’t strong enough. So I went back to the road hoping someone would stop and help me. I was standing at the side of the road waving down the passing cars. The snow was up to my knees and I was freezing, but no one would stop. I was becoming more and more desperate. So I thought to myself: “Dearest Sai Baba, please help me!” I had hardly finished the thought when a car coming from the opposite direction suddenly turned to my side of the road and blocked the traffic in that way. Cars driving on that lane stopped and two men came out of the first car and ran to me asking if I needed any help. I found it strange they didn’t mind the car that blocked their way. Another man from a lorry joined us, too. The three of them pushed my car back on the road saying how lucky I was that my car only had a few scratches. When I looked for the car that blocked the traffic to send my saviours to help, it wasn’t there any more. It disappeared without a sound and nobody seemed to notice it, so I wondered if I was the only one that had seen it. Grateful for the happy outcome I drove on. Could your Master please tell me if it was Sai Baba that helped me? For many years, Share International has been inundated with photographs from all over the world showing miraculous light blessings and patterns of light. We now have a vast archive, a fascinating and awe-inspiring collection of photographs. We present a small selection from the constant stream of ‘miracle photographs’ we receive from around the world (see this month pictures-slow page). We take this opportunity to thank readers for sending them, in the knowledge that they contribute to the ever mounting number of signs heralding Maitreya’s presence in the world. Adam Parsons is the first foreign journalist to visit Swami Premananda since his imprisonment in India in 1994. We include two segements from this vivid article in which he describes conditions at the prison and the impact the Avatar is having on those around him. For the complete article see Share International July/August 2006. In a remote village on the edge of southern India, far off the tourist maps, a cheery holy man continues his fixed routine. Between six in the morning and six in the evening, Swami Premananda gives a daily spiritual discourse to an audience of hundreds, writes personal replies giving advice and support to an unending stream of letters, holds open interviews every day for the poor people around him, while constantly overseeing the management of a fruit plantation, a flower nursery, an orphanage, a school, and an ashram more than 250km away. It may sound like the life of a particularly conscientious sage, except that Swami Premananda has languished behind bars for more than 11 years, and the people who seek his daily counsel are fellow prisoners in Cuddalore jail…. The jail where Premananda has lived since 1998 is a five-hour train ride from the ashram in a dusty coastal town called Cuddalore that was ravaged by the tsunami of late 2004. No tourist would have a reason to come here, especially not at the muddy end of the rainy season, but I had been warned not to let slip the purpose of my visit considering the damning opinion most Indians hold against Premananda. It added to a slight sense of being on a furtive assignment – the Swami had never met with a foreign reporter since his arrest, so if anyone asked, I was told, then I should pretend to be on my way to the seaside French colony at Pondicherry. A small gathering of us assembled at a nearby village in the early morning before herding into a couple of 1950s-style Ambassador taxis. The prison stood two km away in a silent and gloomy woodland, enclosed by a barren forecourt and a towering wall guarded by sentries with old-fashioned rifles. It became more surreal as our entourage gathered around Premananda, who was quietly sitting on a stool in the corner of a bare and windowless cell. Many people who first meet Swamiji, as he is normally referred to, say how differently he comes across from the usual notions of the sombre holy man, but with a full round beard, ever-smiling white teeth, and wearing a wrap-around cloth called a lungi, he almost seems like the stereotypical wise and jubilant guru. He speaks to foreigners in a charismatic, self-taught English that requires some translation from those more experienced in his enjoyable style of jumbling up clauses and missing out verbs, and it can be difficult not to laugh along with his animated explanations. The PR officer who translated explained that Premananda is going blind from untreated eye cataracts and diabetes, as well as suffering from high blood pressure, ear problems and chronic asthma. In the monsoon summers, I was told, rains could flood each prison cell to knee height. “There are barely any facilities – no roof, no fan, no light, no bed. I have to sleep on the floor!” Premananda explained, squinting and chuckling through the bars. He described these conditions with such jollity and mirth that it was easy to overlook how terrible it must be. In a previous discourse given in the prison, he explained that at night it was “so hot you can hardly breathe”, forcing him to use “a hand fan made from coconut palm” which “my hand goes on fanning automatically even when I am asleep”. One ex-inmate of Cuddalore jail, Mr Shankara, spoke of becoming so attached to Premananda that he refused to leave prison upon his release. As Swami Premananda faces the prospect of 18 more years in prison without further appeal, the counter-allegations in his lawsuit are so serious that many supporters believe the details warrant scrutiny in an international court. Ram Jethmalani, despite being retired from practising law at the age of 83, has vowed to personally champion the case until a presidential pardon or reprieve is issued. “One has to hang one’s head in shame,” he said after the Supreme Court judgement, claiming that the verdict has caused international embarrassment in the Law Schools of India by effectively sanctioning the beating up of witnesses to “extract what the police regard as truth”. The implications are so forbidding, he warned, that legislation should be urgently introduced to reverse the law as currently laid down in India…. Ilse Baker interviewed clinical psychotherapist Dr Ed Tick, PhD about the devastating effects of Post-traumatic Stress Disorder. The following is a brief excerpt. Ed Tick, PhD, is a clinical psychotherapist and the director of Sanctuary: A Center for Mentoring the Soul, based in Albany, New York, USA. His specialty is Post-traumatic Stress Disorder (PTSD), which affects nearly 20% of soldiers returning from Iraq. War and the Soul: Healing Our Nation’s Veterans from Post-traumatic Stress Disorder is his most recently published and very timely book. Ilse Baker interviewed him for Share International. Share International: The title War and the Soul is surprising. What made you choose it? How did you become involved in treating the wounds of veterans? Do you consider these wounds to be psychological, spiritual, or both? Ed Tick: I began working as a psychotherapist with traumatized Vietnam veterans in 1979. I soon realized that war is so wounding to body, mind, heart and spirit that what we now call PTSD is not simply a stress and anxiety disorder, as it is classified. Rather, war damages all our vital functions, transforming how we think, perceive, feel, love, imagine, work, play, trust, our morality, belief systems and motivation. Throughout time, these functions have been considered essential human characteristics attributed to the soul. Thus, PTSD can best be understood as an identity disorder that transforms the sense of self, and a soul wound distorting every vital human trait. I protested the Vietnam War while in college. I began work as a psychotherapist in 1975 and soon veterans were coming into my practice. In the protest movement we used to say: “Bring the boys home.” Some of these vets hadn’t made it all the way back. I determined to do all I could to help bring them truly home. Throughout time, young men have had to perform service, often as warriors, as their rite of passage. Modern military service, and especially experiences in wars like Vietnam and Iraq, do not provide that rite in a sacred, life-affirming manner. Serving veterans was my alternative service and rite of passage into manhood and maturity. SI: Many people hope that war will become obsolete, the sooner the better. Millions of people in this country and around the world demonstrated for peace in March 2003 before we invaded Iraq. Still, in your book you write: “...we crave the state of being war offers us. We are aroused by it, addicted to and in love with the archetype of war…. war gives us meaning….” Who do you refer to by “we”? This is very discouraging to read. ET: If reason and compassion prevailed, war would have been obsolete long ago. But it has powers over all humanity, especially but not exclusively our violent American culture. It is arousing, addictive, and provides unity, cohesion and direction to cultures and nations, especially when they are internally troubled or lost, as America is today. War appeals to the most basic instincts; indulging them is nearly irresistible to many people. In addition, Jungian psychology teaches that the archetype of the warrior is universal and somehow needs to be developed and satisfied. These dimensions of war’s near-universality are demonstrated by the prevalence of deities of war in most traditional mythologies. All this may indicate that we will never successfully end war through rational, political or historical means. We must nurture a spiritual evolution for all of humanity, such that our higher functions – heart, mind, spirit – unite and co-operate so that we are able to transcend the violent pull of the instinctual. The following short excerpt of an interview with the President of Slovenia Dr Janez Drnovsek reveals him to be a man of unusual vision. His commitment to the common good informs everything he says. Dr Janez Drnovsek, President of the Republic of Slovenia, was formerly Prime Minister of Slovenia for 10 years, and from May 1989 to May 1990 Head of the Presidency of the former Yugoslavia. In September 1989, he chaired the 9th Summit of Non-aligned Countries in Belgrade and was the chief negotiator in talks on Slovenian autonomy. He is also an economist, political analyst and promotor of consensus politics. He has received many international awards honouring his political, economic and humanitarian achievements. At the beginning of 2006 he started the humanitarian and political campaign Movement for Justice and Development to try to solve the crisis in the Sudanese province of Darfur. So far this year he has travelled to France, the USA, Bolivia, Romania, the Qatar Emirate, Sri Lanka, Spain, Portugal, Israel, Palestine and Cyprus. Saso Segula Prosenc interviewed him for Share International. Share International: Several months ago you changed your attitude, almost overnight, to your role as State President. You have been very actively engaged in endeavours for peace and justice in the world. The media and the general public noticed your sincere commitment. What caused this change? Dr Janez Drnovsek: Does it matter what caused it? I could answer in this way: at a certain point you reach a level of consciousness which then leads you to abandon former, more usual, patterns, which may be more common in politics. But then you find out that this is not enough, that it is necessary to really start solving the many problems of mankind and that conventional politics with its usual approaches does not solve them, or, at least, not sufficiently. Something more has to be done. It was the realization and awareness of this fact that caused this change. SI: We can see you are no longer a conventional politician. You have been encouraging and connecting the people of goodwill, supporting their endeavours, acting to make people aware. Recently you founded the Movement for Justice and Development. What does this mean for Slovenia and the world? JD: It is essential to raise consciousness. The world is out of balance; there are many problems – from the issue of poverty to the fact that many people still die of hunger as well as the destruction of the Earth and climate changes. We must be aware that these imbalances are enormous and that they are on the increase. Sometimes we humans feel that there is someone who will eventually take care of everything so that it will go in the right direction. I think that – like passengers on a bus who suddenly find out that there is no one steering the bus – we will have to do something ourselves in order to change the direction of human development and the way we act. And that is a matter of consciousness; that we become aware of these problems and of the fact that we ourselves will also have to do something – each of us, whether we are at home, at work, each in his own environment can act. The only way to change anything in the world is to raise the level of consciousness. The attempts in the past, various revolutions, failed for the most part because they used violence, which is a bad foundation. It is not possible to build something good on something bad. However, if we change consciousness and more and more people are aware of the need for changes, then it will be possible to do something on that foundation. SI: At the beginning of this year you started a humanitarian and diplomatic campaign with which you wished to encourage governments and different organizations in the world to solve the crisis in the Sudanese province of Darfur. Please describe the situation in Darfur and your vision of how to solve the problem? JD: Darfur is a typically bad situation – a humanitarian catastrophe which some see as genocide. For three years, the international community has been trying, unsuccessfully, to solve the problem. I, too, attempted to help solve the problem of Darfur, if I may say so, at the moment when it seemed that the world had got used to this crisis and that it had become a generally accepted fact, ‘so we don’t need to worry about it any more.’ It seemed necessary to reawaken people’s awareness that something very grave was happening there and that something more should be done. Before the Darfur crisis, there were other situations where the international community delayed: Rwanda, the former Yugoslavia, Bosnia and Herzegovina, where genocide could have been prevented with more determined international action and by being aware at the right time that something should be done to prevent it. But the international community did not know how to do it. After Rwanda, after Bosnia and Herzegovina, we international politicians said: “There must never again be a Rwanda, never another Bosnia and Herzegovina.” At the United Nations Summit last September , we agreed that the UN should intervene in cases where national governments were not capable of, or not taking responsibility for, ensuring the survival of their people. The international community undertook to intervene in such situations, not to respect the state’s sovereignty if that sovereignty meant that people were dying there or that the national government was unwilling or unable to protect them. In such cases, the international community is obliged to act. That agreement was reached in September and in all the months since then nothing happened in Darfur. The situation was getting worse, so I called attention to Darfur with a humanitarian campaign organized in Slovenia. It also seemed important for Slovenia: while we are helping people in Darfur we are also raising awareness in the Slovenian people. We are learning through this case and it reminds us that we are interconnected, that the people there are in distress now, and at some other time it could be us who would need help, and that now we must help. I started a political campaign to focus the attention of the international community and the media on finding a political solution to solve the crisis. SI: At the beginning of March  you visited the Middle East, where you talked to Israeli political leaders and to Palestinian President Mahmoud Abbas. What was the purpose of that visit and how did Israeli and Palestinian leaders respond to your words? JD: Yes, I visited Israel at their invitation at quite a specific time – just after Hamas won the elections in Palestine, and when Israel was in a special situation before the elections due to Prime Minister Sharon’s condition. It was a time of considerable uncertainty. It was interesting to exchange views with Israeli and Palestinian political leaders. This is one of those situations that has lasted too long and constantly generates a cycle of violence and hatred. But it is time indeed that they find a solution. I told both the Israelis and the Palestinians that they deserved peace and stability – that they should find a way out of that cycle. So my approach was not to condemn Hamas in advance but rather that Hamas must be given a chance. For the first time Hamas is in a position of responsibility. By electing Hamas, the Palestinian people put a lot of responsibility on Hamas and the Palestinian people want peace. They don’t want an escalation of violence, I am sure. If Hamas’s leaders are responsible and serious people, they will have to comply with the Palestinian people’s wish. SI: The world has become smaller due to information technology and the media, and the poor are directly confronted with the gulf between them and the minority wealthy nations who have far too much and practically all natural resources. Can such a system last? JD: No, I think it can’t last. This situation is intolerable. It is shameful. The majority of people live in poverty, and a small minority disposes of enormous wealth. This is immoral, unethical and cannot endure in the long run. Sooner or later it will strike back in some way and also affect those who have plenty now. If the majority of people in the world think that this world is unjust, that also the distribution of wealth is extremely unjust, then sooner or later something must happen. This majority will simply not accept the situation quietly. If nothing else, this situation is creating an atmosphere which encourages terrorism. In an environment where people are convinced that the world is unjust, there is, of course, much more basis for terrorism and more people ready to engage in it. The modern world has the means for mass destruction at its disposal. If terrorists get hold of such means, sooner or later there could be a catastrophe for the whole world from which no one can isolate themselves. The wealthy now think that they can isolate themselves from the rest of the world and ensure their security. They cannot. No one can. The world will have to be arranged differently and I mean through awareness, not revolution. In the past, problems were solved by revolutions which changed the system with violence and redistributed the wealth. It turned out that this was not right. However, as their level of consciousness rises, more and more people will be aware that this situation is unbearable and those who have a lot will ultimately realize this fact. It will actually become impossible to look at millions of people dying while someone has billions of dollars and does nothing to change the situation. The biggest countries, including the most powerful country in the world, should do much more to help. If the strongest country in the world committed all the funds that it expends on armaments in one year to solve poverty it would immensely increase its reputation in the world. It would gain moral credit and its popularity would be much greater than now when it expends money on weapons and defence. This, too, is a matter of awareness in politicians and the people. In this section Share International focuses on the rising tide of people power which will continue to swell until, under Maitreya’s wise guidance, the people will lead their leaders into the creation of a just society in which the rights and needs of all are recognized and met. An entire island population deported en masse when the British government ‘sold’ their homeland from under them to the US military have won a resounding legal victory in their fight to return to their homeland. In the 1960s and 1970s the entire population of the tiny British-ruled island of Diego Garcia, in the Indian Ocean Chagos archipelago, was terrorised, attacked and forcibly removed to Mauritius and the Seychelles in a mass deportation prompted by Pentagon demands for the island to be “swept” and “sanitized”. Since then, the Chagossian islanders have lived in poverty and deprivation in the Mauritius slums, while the US has built the most powerful military installation in the Indian Ocean – the base from which it has attacked Afghanistan and Iraq, and could possibly launch an attack on Iran. The enforced exile of the Chagossians violated UN Declaration 1514 on the inalienable right of colonial peoples to independence. In 1965 UN Resolution 2066 instructed Britain to “take no action which would dismember the territory of Mauritius and violate [its] territorial integrity”, but the UK has continued to deny that there was ever an indigenous population on Diego Garcia. With the help of their remarkable lawyer Richard Gifford, the Chagossians have won four landmark legal rulings in British courts – all of which have been ignored or evaded by the British government. The first ruling, in 2000, shocked the government when the High Court cited the 1215 charter Magna Carta, which proscribed “Exile from the Realm” without due legal process. In the last hearing, in the High Court in May 2006, Sir Sydney Kentridge QC described the treatment of the Chagossians as “outrageous, unlawful and a breach of accepted moral standards”, and said there was no known precedent “for the lawful use of prerogative powers to remove or exclude an entire population of British subjects from their homes and place of birth”. Brian Haw, the peace protestor who has camped day and night opposite Britain’s Houses of Parliament in London for five years, has vowed to continue his campaign in spite of the government’s sustained effort to rid Parliament Square of this “eyesore”. Haw points out that the real eyesore is the effect of depleted uranium munitions on the babies of Iraq. On 23 May 2006, the July 2005 Serious Organised Crime and Police Act was invoked to remove and trash his antiwar placards in a police night-raid, in an attempt to reduce his ever growing line of banners and placards to only three metres, but the heavy-handed police methods were dubbed chaotic and farcical by the media and raised a storm of protests among human rights and antiwar groups. Newspapers mocked this “fearless pre-dawn swoop on 120 ft of cardboard”, and supporters vowed to replace the placards. An embarrassed government was forced to admit that the raid, involving no less than 78 police officers, cost £7,200 ($13,500). Increasingly mothers, grandmothers, wives, girlfriends and sisters of soldiers are showing their opposition to their loved ones serving in the war in Iraq. With President Bush’s popularity ratings at an all-time low, he has had to contend with opposition from a new group – the ‘peace grannies’. Made up of various strands – Grandmothers Against The War, Raging Grannies of Tucson, Arizona, and Grandmothers for Peace International – they use the positive social stereotype attached to grandmothers, and the reluctance of the authorities to come down too hard on them, to highlight their cause. In October 2005 New York police were called to a disturbance at the military recruitment centre in Times Square, and found 18 elderly women blocking the entrance and demanding to enlist in place of young men. The ‘Grandmothers Against The War’ were arrested after refusing to leave the building. At their trial in April 2006, protesters stood outside the court with banners reading: “Arrest Bush, Free the Grannies,” and “Can’t whip the insurgents? Whip Grannies!” Their plight caught the imagination of New Yorkers and the media. Norman Siegel, a veteran New York civil liberties lawyer who acted on their behalf, said: “I think the grannies really resonated with the public. First, everybody has a grandmother. And second, these are very accomplished women who are incredibly passionate, intelligent, witty and charming. My strategy was to put every one of them on the stand so that the judge and the public could see who they were: people of conscience.” That strategy led to amusing scenes in the courtroom, in which it sometimes seemed as if the youthful judge and prosecutors were being cross-examined by the defendants. The peace grannies won their case and are continuing to demonstrate in the USA. Women of all ages gathered in Washington on 14 May 2006, Mother’s Day in the USA, to protest against the war and to remember their sons and grandsons lost in the conflict. Sponsored by grassroots women’s organization Code Pink, the demonstration, named ‘Declare Peace on Mother’s Day’, included a mini-parade, a 24-hour vigil and speeches from activists including Cindy Sheehan and actress Susan Sarandon. “I don’t want any more moms to grieve for a child lost in this unjust, unnecessary war in Iraq,” said Sheehan, whose 24-year-old son was killed in Iraq. 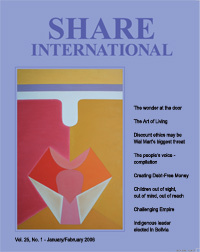 Over the years, Share International has printed articles outlining Maitreya’s expectations concerning political, social, environmental and spiritual changes in the world, as presented to us by one of Maitreya’s associates in the London community in which He lives. From time to time, both Benjamin Creme and his Master have shared their prognosis of future developments. In this section, “Facts and forecasts”, our staff monitors recent news, events and comments bearing on these insights. At the UK’s Hay Book Festival in May 2006, the head of British scientific institution the Royal Society warned that humanity has reached a “defining moment” in our dominion over the planet and our ability to destroy it. “The 21st century is the first in the Earth’s history where one species has our planet’s future in its hands and could jeopardise life’s immense potential,” Lord Rees said. It is surely a sign that the ‘ecological tipping point’ has been reached when a documentary movie about the dangers of global warming breaks box office records in its first two days of screening. Former US Vice-President Al Gore’s film An Inconvenient Truth (directed by Davis Guggenheim) has the highest per-screen rating for any Memorial Day weekend opening since Jack Nicholson in The Shining, and the highest ever for a documentary. Al Gore has always been passionate about environmental issues. He has spent 30 years researching climate change and presenting his findings on the dangers connected with global warming. “This really is a planetary emergency,” he says. Now his expertise and committed concern about ecological issues have been combined with the skills of expert movie makers to produce An Inconvenient Truth; he has also written a book of the same title. “Humanity is sitting on a time bomb. If the vast majority of the world’s scientists are right, we have just ten years to avert a major catastrophe that could send our entire planet’s climate system into a tail-spin of epic destruction involving extreme weather, floods, droughts, epidemics and killer heat waves beyond anything we have ever experienced – a catastrophe of our own making,” to quote Gore’s own website dedicated to environmental issues. The film is very obviously making an impact which has caused a backlash. The Competitive Enterprise Institute, funded by oil companies, has already produced and is showing television ads refuting Gore’s arguments. Al Gore, An Inconvenient Truth. Rodale Press, Emmaus, PA, USA, 2006. Three teams of scientists have independently released reports in May 2006 concluding that global temperatures could increase much more than currently estimated. In this section, Share International reviews current affairs in order to highlight issues which urgently require a new approach and lasting solutions. Weapons of Terror sets out 60 proposals on how the world could be freed of nuclear, biological and chemical weapons. The report analyses the present threats to world peace and stability and includes statistics such as the fact that there are now an estimated 27,000 nuclear weapons, 12,000 of them currently deployed. The Commission’s report also focuses on how threats and risks can be dealt with and includes assessments of the situation in Iran, the Middle East, North Korea, India and Pakistan. The commission appealed to all countries to sign and ratify the Comprehensive Test Ban Treaty while calling on nuclear states to cut their present arsenals and stop developing more weapons. The WMDC also recommended that both Iran and Israel should hold back on uranium enrichment and other sensitive nuclear activities as part of a new initiative to rid the Middle East of weapons of mass destruction. Blix was critical of the US stance: “While the reaction of most states to the treaty violations was to strengthen and develop the existing treaties and institutions, the US, the sole superpower, has looked more to its own military power for remedies.” Washington should move to bring about arms limitation: “If it takes the lead, the world is likely to follow. If it does not take the lead, there could be more nuclear tests and new nuclear arms races,” Blix said. Mohammed ElBaradei, the 2005 Nobel Peace Prize winner, addressing the Paul H. Nitze School of Advanced International Studies at Johns Hopkins University, warned that it is becoming more difficult to contain nuclear weapons development. “Nukes breed nukes. As long as some nations continue to insist that nuclear weapons are essential to their security, other nations will want them. There is no way around this simple truth,” he said. Major powers insist on their right to maintain a nuclear arsenal which, understandably, leads other countries to follow suit and this against a background of attempts to curb nuclear activity in other countries such as Iran, said the head of the UN nuclear watchdog, the International Atomic Energy Agency. ElBaradei maintains that mutually assured destruction (such as prevailed during the Cold War) was a fairly sensible strategy of deterrence. But, he added, blocking nuclear technology transfer is no longer a safe option in a world where advanced communications make it easy to share knowledge. We need to develop an “alternative system of collective security ... that eliminates the need for nuclear deterrence”. “Only when nuclear weapons states move away from depending on these weapons for their security will the threat of nuclear proliferation by other countries be meaningfully reduced,” he said.